Pound bulls are still keeping their fingers crossed for a Brexit deal, preventing this pair from gaining more traction on its breakdown. And for that reason, I’m out! I hopped in on a pullback to the broken long-term ascending channel visible on the pair’s daily time frame. Price bounced off this area of interest all right, even dipping below the 1.2800 mark at some point, but optimism for a Brexit deal returned later on. I decided to trail my stop lower in order to reduce my risk ahead of the BOE decision last week, which did revive some confidence that the U.K. economy could stay resilient. I figured I’d place my stop slightly below my entry in order to lock in a few pips in case price heads further north. And climb it did! A combination of risk-taking and even more Brexit optimism lifted GBP/CHF back up to the 1.3100 levels, even higher than the previous retest of the broken trend line support. With that, my adjusted stop was hit, locking in 50 pips on my position. I know, I know… I could’ve caught so much more! In retrospect, I probably should’ve just jumped out completely around the bounce off 1.2800 instead of giving up more paper profits. Still, I’m pretty happy with my risk management decision, knowing that price really could’ve gone either way. Did you guys try to trade the pound lately, too? How are your positions looking these days? 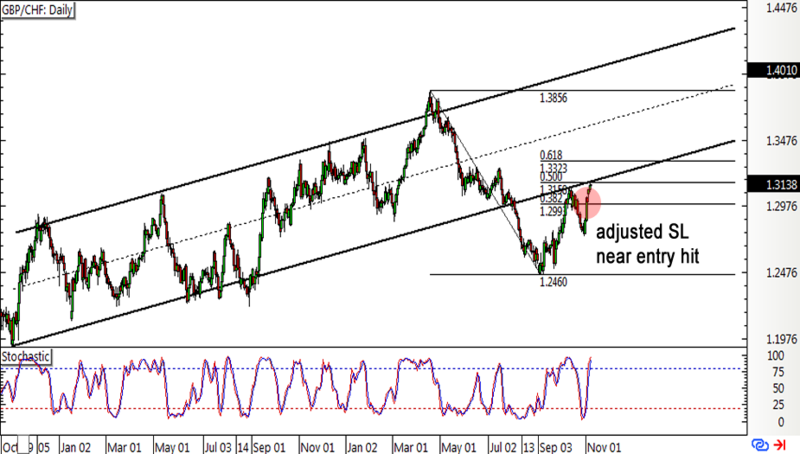 More Downside Momentum for GBP/CHF? With Brexit concerns back in the spotlight, I’m looking at this bearish long-term pound setup that might show a bit more momentum in the days ahead.